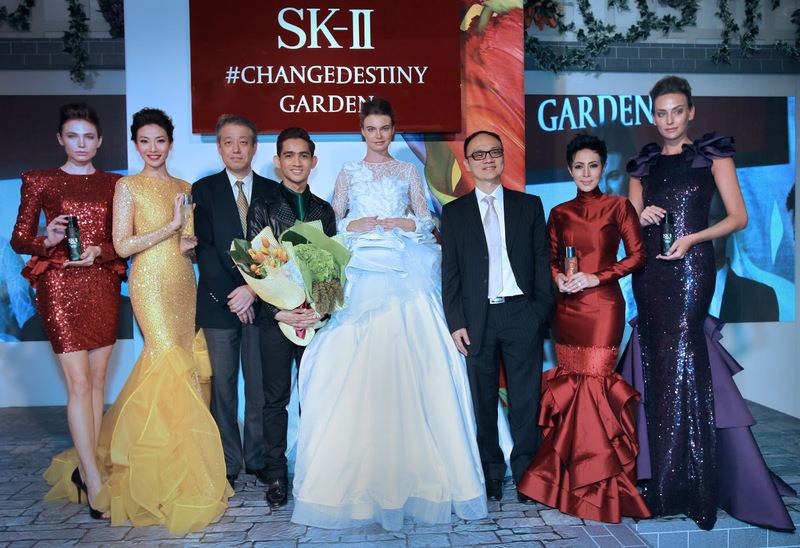 One of Malaysia's hottest designers, the award winning Hatta Dolmat, unveiled a stunning haute couture Festive Collection at the launch of SK-II's Limited Edition Festive Facial Treatment Essence Collection at a prestigious event at the SK-II #ChangeDestiny Garden in Suria KLCC this week. Inspired by the beautiful and vibrant colours of the flowers of the Tulip, Hydrangea, Freesia and Green Cypress, the flowers used by Taiwanese artist, Poh Chih Huang in his designs for the SK-II Limited Edition Collection, Hatta weaved his magic to design 10 signature couture gowns including a breath-taking bridal gown as a finale to his showcase. Hatta's creations reflect the haute couture interpretation of Poh's creative technique of working with flowers to bring out the different aspects of their beauty and vitality through transformation - a celebration of everlasting beauty as a tribute to Pitera's transformative power. Hatta said, "I feel that there's a lot of synergy working with SK-II as it is a prestige skin care brand and my designs are prestige statements. SK-II transforms a woman's skin to be beautiful while I make a woman beautiful through my designs. I was particularly inspired by the flowers and the garden theme from the SK-II Limited Edition Festive Collection which was so refreshing and gave me such a positive vibe with the colours and textures from the flowers used." The captivating limited edition Facial Treatment Essence will be available at all SK-II counters in Malaysia from 1 October 2014, as part of SK-II's festive coffret sets. Will update you guys on the SK-II festive conffret sets.